First thing that must be said, although this recipe might give the impression of being complicated, it’s actually relatively easy. The dough can be ready in about 20 minutes flat (with a stand mixer), and then allowed to rise and rest overnight (or for up to two days in the fridge) so that all you have to do on Christmas morning is assemble it, let it rise again, and bake it. 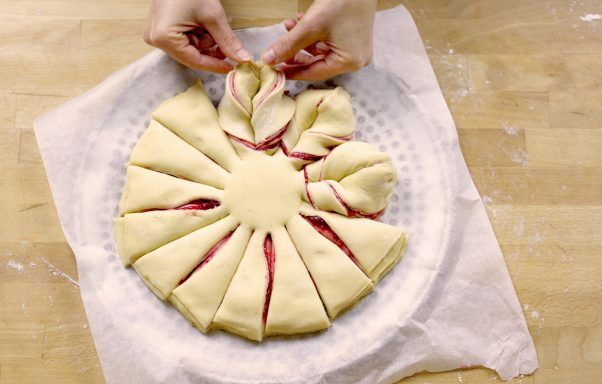 The showy star is achieved by rolling out the dough and sandwiching it with bright red jam, then making cuts in a circular pattern and twisting the ends together. I use cranberry jam which takes just 10 minutes to make (use organic cranberries if you can find them because conventional cranberries are grown in a bit of a chemical soup, unfortunately). If you prefer, you can substitute any jam of your choice. 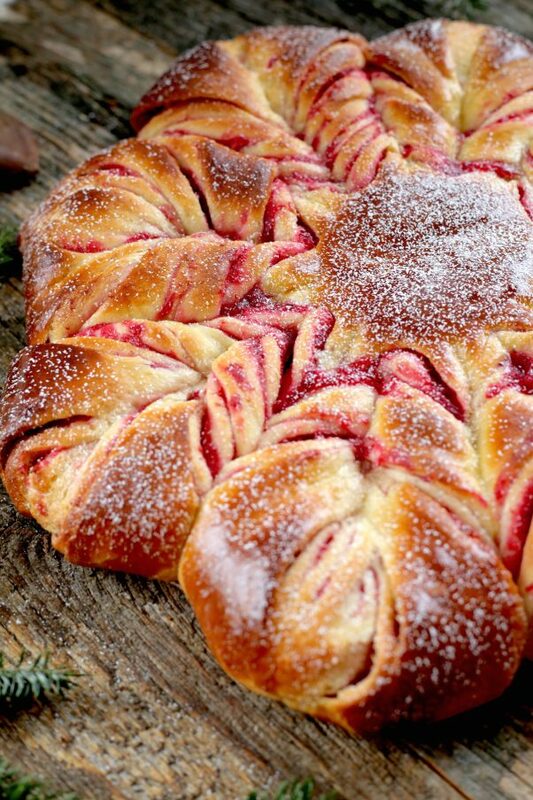 This brioche throws some dazzle and flair on the Christmas breakfast table, it also makes a unique gift to bring to friends and family. If you’re looking for more savory Christmas breakfast recipe ideas, be sure to check out my post from last year on Tourte Milanaise, and two years ago on Kale and Sun-dried Tomato Strata! Please let me know if you make this in the comments below. May you and yours have a delightful holiday season, surrounded by good food and your loved ones. 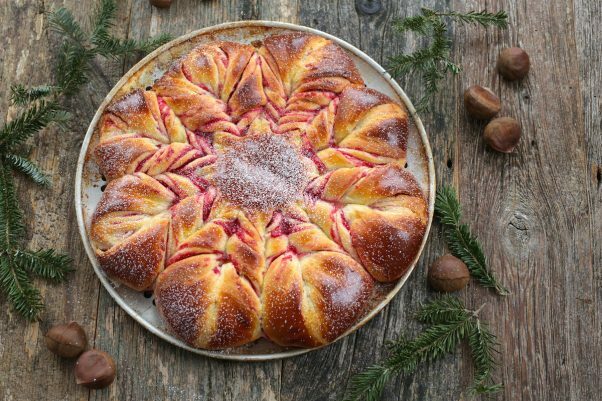 A holiday morning is the perfect time for a homemade, warm sweet bread. 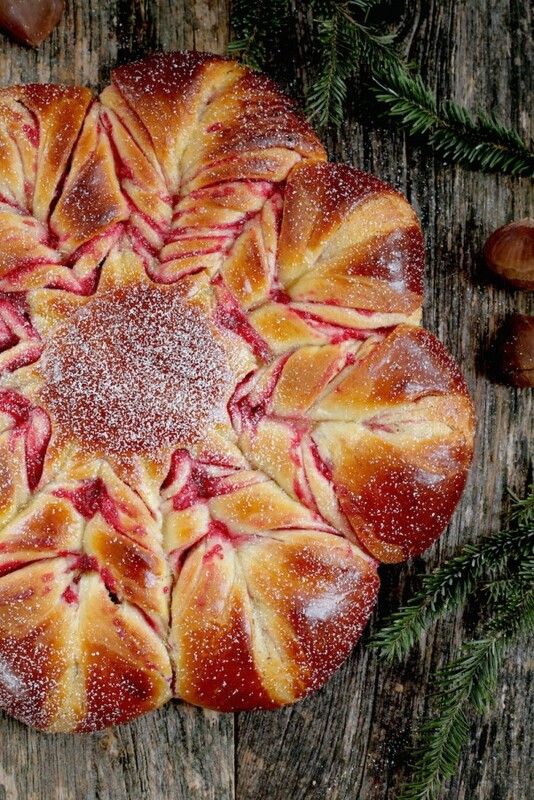 This cranberry orange brioche won't disappoint. 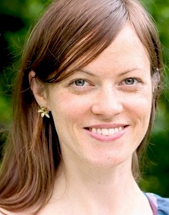 Aube Giroux shares more about this dish and her holiday traditions in the Kitchen Vignettes blog. About an hour before you begin making this, place the milk and butter on the counter to bring them to room temperature. Stir the yeast into the room temperature milk with a pinch of the sugar and let it rest for about 10 minutes until it has dissolved and started to froth. (Yeast takes a bit longer to bloom in milk than in water so give it a good 10 minutes). While the yeast blooms, place all the remaining dough ingredients into a stand mixer bowl (except the butter, and the egg wash ingredients). Once the yeast and milk mixture is frothy, add it to the ingredients. Using the dough hook attachment, knead everything together in the stand mixer on low speed for about 2 minutes or until it has come together into a ball. (I recommend a stand mixer because this dough is messy and can take some skill and time to knead… but in the absence of a stand mixer, here is a good primer on how to hand knead brioche dough. Be sure your butter has softened to room temperature. After an initial 2-minute slow knead in the mixer, increase your speed to medium. Add the butter, one tablespoonful at a time. Wait between additions until the each tablespoon of butter is almost fully incorporated into the dough, 10 seconds or so, between each new piece of butter. After all the butter is incorporated, knead on medium speed for another 8 minutes or so, until the dough is smooth and glossy. Brioche dough is soft, resist the urge to add more flour. The dough will become more easy to handle after it rests in the fridge. Make the cranberry “jam” (or use your own favorite jam). Place the cranberries, sugar, orange juice and water in a small saucepan and bring to a boil. Turn down the heat and let it all simmer for about 10 minutes. Remove from heat, allow to cool, and purée with a hand blender until smooth. After an overnight rise, remove your dough from the fridge and turn it onto a floured board. Cut it into 4 equal pieces and shape them roughly into balls. Take a piece of parchment paper, sprinkle a little flour on it, and roll the first ball into a 10-inch circle, about 1/4 inch thick (use a cake pan as a guide to cut them into even circles). Spread approximately 1/4 cup of cranberry jam on top of the dough. Spread it evenly and don’t lay it on too thick, leaving about 1 inch “jam-less” along the outside edge. Roll out the second ball of dough to a 10-inch circle. Transfer it gently on top of the jam-covered first circle. Repeat this until your reach the final fourth ball of dough but don’t spread jam on this last one. Try to work quickly because as the butter in the dough begins to reach room temperature, the dough will become more difficult to work with. If at any moment you find your dough too difficult to work with, simply return to the fridge for 15 minutes. Or use a little more flour to roll it out, brushing it off after the rolling is done. Slide the parchment paper and brioche carefully onto a baking sheet. Place the whole thing in the fridge for about 15 to 20 minutes to make it easier to slice cleanly. Using a 3 to 4-inch round cookie-cutter (or the rim of a glass turned upside down), make a delicate imprint right in the center of your jam sandwich. Using a sharp chopping knife (serrated knife is not recommended), slice 16 even cuts all around the outer edge of the center circle. If needed, slide the parchment paper back onto a countertop to make it easier to cut. Pick-up 2 strips at a time and twist them outwards from each other twice. Press the edges together and repeat until you have a lovely star! You can adjust the points of the star after to clean up any untidy ones. Cover with a clean towel and put the brioche in a warm place to rise for about 1 1/2 hour. (Don’t leave it for much more than that, unless your kitchen is very cold). Before putting the brioche in a 350F preheated oven, whisk the egg and 1 tsp milk together. Brush the brioche with a light layer of this egg wash to give it shine and color. Bake the brioche for about 30 minutes or until the top is golden. Serve warm.